During the reign of the Incas (1438-1532 A.D.) the Cusco's importance was at its height, but the origins of the city are shrouded in myth and legend. One of the most common stories, that has been handed down as part of the famous chronicles of the Inca Garcilaso de la Vega, tells of Manco Cápac and Mama Ocllo emerged from Lake Titicaca at the islands of the Sun and the Moon, sent to earth by the solar and lunar deities to bring culture to a barbarous world. From there they began a lengthly quest (about 500 km. if they took the shortest route over the Raya pass) which ended in a valley far to the north, at the spot where Manco probed with his golden staff, and it disappeared into the ground. Here they founded their civilization, and the Inca city of Cusco. Cusco was the center of government of the four regions of the Inca empire, which covered large parts of what today are Ecuador, Colombia, Peru, Bolivia, Argentina and Chile. Inca society was fantastically organized, and had an impressive knowledge of architecture, hydraulic engineering, medicine and agriculture. The Spanish Conquest In the year 1534, the Spanish arrived under the command of the conquistador Francisco Pizarro and a Spanish city was founded on the site of the Inca Cusco, turning the Andean world—and its two thousand years of independent development—on its head. Many important Inca constructions were destroyed or served as the base for other new constructions, as can clearly be seen at many temple sites. In 1650 the city was badly affected by a violent earthquake that destroyed almost every colonial building . Later in 1780 the city was once again shaken but this time by a social-quake: the Tupaq Amaru II rebellion (today, traditionally the Spanish form of his name is used; originally it was Jose Gabriel Thupa Amaro Inga, as it was signed by himself) He fought for the Peruvian emancipation but unfortunately was betrayed, defeated and then executed as well as his whole family and followers in the same city's Main Square. 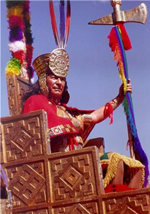 Between 1814-15, Mateo Pumakawa who was the chief of the village of Chinchero and in his youth had fought against Tupaq Amaru II; began once again another rebellion in order to emancipate the country along with the Angulo brothers and some other Peruvians. They were defeated and later executed by the Spanish army. In 1821 Peru got finally its independence from Spain at the end of a long, cruel and bloody process developed in all the countries of Hispanic America. The Lost City of the Incas In 1911, using information provided by local peasants, the American researcher Hiram Bingham discovered the legendary Inca citadel of Machu Picchu, which is today one of the main tourist destinations on the American continent, and is considered one of the world's most outstanding feats of architecture. Nestled between the mountains of Machu Picchu ("Old Mountain") and "Huayna Picchu" ("Young Mountain"), in the middle of the tropical jungle, it comprises military fortifications, squares, temples and terraces for cultivation. It is known that the site was the center of a cult, an astronomical observatory, and private property of the Inca Pachacutec and his family. In 1933 the 25th Congress of Americanists performed in Ciudad de la Plata, Argentina, declared Cusco City as the " Archaeological Capital of South America". In 1950 another bad earthquake of 7° in the Mercalli scale had shaken the old Inkan Capital that left just one quarter of its buildings standing. In 1978 the 7th Convention of Mayors of the World Great Cities, performed in Milan, Italy, declared Cusco as " Cultural Heritage of the World". In Paris, on December 9, 1983, the UNESCO declared Cusco as " Cultural Patrimony of Humanity". On December 22, 1983, by means of Law Nº 23765 the Peruvian government declared the city as " Tourist Capital of Peru" as well as " Cultural Patrimony of the Nation". Today Qosqo is capital of the department having the same name and at the same time the seat of the Inka Region formed along with the departments of Apurimac and Madre de Dios. The 1993 Peruvian Constitution declares Cusco as the Historic Capital of the country.